At TOPS, we recognize the service of the men and women who fought and continue to fight for our country's freedom. On Veterans Day, we are especially reminded of their bravery and we are humbled to honor their contribution to our nation. This Veterans Day, Sunday, November 11, TOPS will honor an 11% discount off of a total order to all veterans and active military personnel who shop at any of our locations. Be sure to bring proof of service as a U.S. 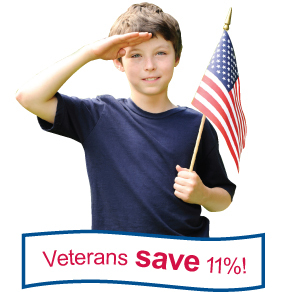 Veteran, active duty, reserve or retired military personnel to any TOPS location and you will automatically receive an 11% discount off of your total purchase that day. Offer excludes Instacart, pharmacy, fuel, TOPS Xpress, gift cards, office services and, by law, alcohol and tobacco.